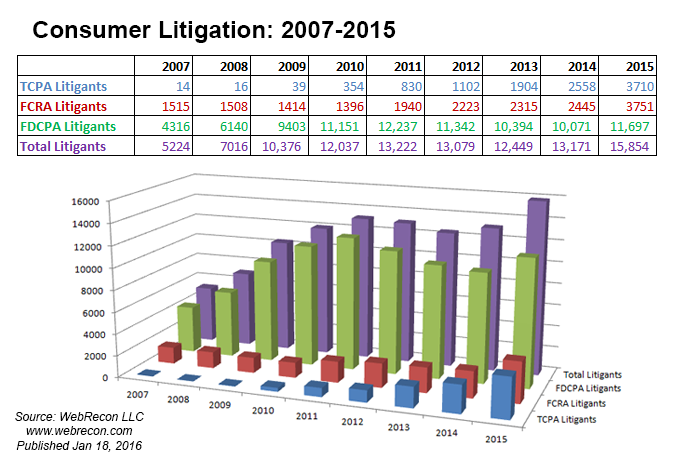 The total number of unique consumer plaintiffs has been growing aggressively, along with the total amount of litigation. After peaking in 2011, the number of unique litigants had more or less plateaued at around 13,000. That is, until this year, when it exploded to a record 15,854 unique individuals. CFPB complaints against debt collectors also set a record-high in 2015, but only barely at this point (up 1.5%, from 39,367 in 2014 to 39,952 in 2015). Expect that to increase in the weeks ahead, but only nominally. For the month, FDCPA was the only one to dip a bit over Nov, down 3.5%. TCPA was up 5.9% and FCRA was up 5.6%. CFPB suits were up 1.3%, and will likely keep inching up for another couple of weeks. For December 2015, a higher-than-average 42% of all consumer litigation plaintiffs had sued at least once before under consumer litigation statutes. About 883 different companies were sued, and 716 different debt collectors were complained about to the CFPB. The percentage of suits filed as putative class actions were high all around, with 19.3% for FDCPA, 21.1% for TCPA and 26.7% for FCRA. The Illinois Northern District Court in Chicago once again had the most litigation filed in it, with 90 consumers represented in litigation there. California had the most CFPB complaints against debt collectors, with 336. Attorney David Krieger represented the most consumers for the month with 54, and Todd Friedman represented the most year to date, with 365. Over all of 2015, 35% of all consumer litigation plaintiffs had sued at least once before under consumer litigation statutes. The percentage of suits filed as putative class actions in 2015 were 16.6% for FDCPA (1938 total), 23.6% for TCPA (877 total) and 16.0% for FCRA (601 total). The Illinois Northern District Court in Chicago had by far the most litigation filed in it, with 1037 consumers represented in litigation there. California had the most CFPB complaints against debt collectors, with 5311. Todd Friedman represented the most consumers year to date, with 365. He was followed by Craig Sanders with 332, Sergei Lemberg with 250, Suren N Weerasuriya with 227 and Craig Thor Kimmel with 214. Of those cases, there were about 1275 unique plaintiffs (including multiple plaintiffs in one suit). Of those plaintiffs, about 496, or (39%), had sued under consumer statutes before. Actions were filed in 158 different US District Court branches. About 883 different collection firms and creditors were sued. There were 2686 complaints filed against debt collectors from Dec 01, 2015 to Dec 31, 2015. This includes 2503 (93%) timely responses to complaints, and 183 (7%) untimely responses. Of the company responses, consumers accepted 2403 (89%) of them, disputed 278 (10%) of them, and 5 (%) were N\A. ** Important note: During end-of-year housekeeping, WebRecon staff discovered (and tapped into) a previously undiscovered, somewhat obscure source of additional federal FDCPA, FCRA and TCPA litigation in PACER. This has had a visible impact on the overall statistics.